Got a mortgage? Good news: Bank of Canada didn’t raise rates yesterday! Yesterday, Bank of Canada (BoC) Governor, Stephen Poloz, left rates unchanged. This kept the bank prime rate at 3.45%. This also, indirectly, affects fixed mortgage rates. Great news for anyone with a mortgage. Go ahead, it’s okay to feel good about paying a low interest rate on what’s probably the biggest debt of your life! For months we’ve heard economists forecasting 2-4 BoC rate hikes for 2018. So far, we’ve had one increase – in January. Should we be expecting three more increases? Only time will tell, since the BoC raises its rate when inflation rises above the target inflation rate… currently the range is between 1% and 3%, and sits at an acceptable 2.10%. Some believe inflation has increased temporarily, in part, due to increased minimum wage. A 2nd Bank of Canada rate hike surprises many.. what’s it mean? The Bank of Canada Governor, Stephen Poloz, has been full of surprises since he took on his current role. With a second 0.25% rate hike today in consecutive BoC meetings, he’s pushed the rate to 1.00%. This should result in a Bank Prime rate of 3.20%. The move has surprised many experts as the economic indicators don’t justify a rate hike. The move comes following last week’s surprising positive stats showing the Canadian economy grew by 4.5% in the 2nd quarter, according to stats Canada. Could this be a knee jerk reaction? Usually, the Bank of Canada increases rates when inflation rises above the Target level of between 1% and 3%. A quick search on the BankofCanada.ca website and we see the inflation level is just 1.2%. So, why raise the rate now? According to the BoC press release, it’s all about that recent positive economic data. Hmmm, you have to wonder is they jumped the gun on this one? WHAT’S THIS MEAN FOR MORTGAGE BORROWERS IN CANADA? Standing back, we need to look at where current interest rates are in relation to historical rates. With an expected Bank Prime rate set to increase by 0.25% (Banks usually follow and match the BoC rate movement except 2 yrs ago when the Boc cut the Target rate by 0.50% in 6 months, but the BIG SIX BANKS only cut their Prime rate by 0.30%, pocketing the difference and stumbling to explain why they would profit off the backs of Canadian consumers and businesses during an economic recovery…nice, huh?) This means the new Bank Prime rate will be 3.20%. Are rates high? Are they low? Historically, we are still in record low territory. Fixed Mortgage rates are still just over 3.00% today. Variable rate mortgages are 2.45% to 2.55%. Hey, that’s not bad at all. In fact, it’s still great! Too much emphasis has been put on these rate hikes, as though they would paralyze consumers from being able to spend or make their mortgage payments. This is just untrue. Canadians have had to qualify at Bank Posted 5 yr fixed rates for years, if you chose and Variable rate mortgage. That means you had to pass the stress test using a rate that was 2.00% higher than your actual mortgage. And what’s not talked about enough is that Canadians don’t just pay their minimum required payment. They accelerate and increase their payments. They pay more to pay the debt off faster!. Canadians pay their mortgages off in around 17 yrs on average….with many paying them off in 12 years. Bet ya didn’t know that?! Not likely.. at least not for a while. These 2 consecutive rate hikes will be closely monitored to see how the consumer and the economy can absorb them. If we start to see negative economic stats, we could see rate cuts. It’s not out of the question and it wouldn’t be the first time the Bank of Canada had to reverse their increases. Remember, we have seen major mortgage rule changes that have made it harder than EVER to qualify for a mortgage. This lack of access to mortgage money is having a negative effect on the housing market. Sales are down. Prices have fallen (price decrease isn’t bad but we don’t want a free fall).. Put it all together and you end up with less money flowing into the economy. A slower economy usually means sustained low-interest rate environment… stay tuned folks.. If you are in a Variable rate mortgage, I would stay there. Your rate is less than 3.00%. Why would you want to lock in at over 3.00%? If you are worried that rates could skyrocket, it’s unlikely given the fragile global economy and even our own economic instability. However, if you can’t sleep at night because you are worried about the rates, and don’t mind paying a higher fixed rate for the assurance of knowing what your payment will be, then lock in or choose a fixed rate. I’ll be staying in short term priced products like the Variable rate or a 2 or 3 yr term. These products have proven to be the lowest cost products. Rates went up, so now what do you do? Should I jump into the market now? Actually, my advice is always the same: buy when you are financially ready. Don’t jump the gun just because rates “may” go higher. But by all means, if you’re thinking about buying, I can arrange a pre-approval so you’re protected from rate increases while you shop around. Bank of Canada rate hike.. it’s really not a big deal. BREAKING NEWS… BANK OF CANADA RAISES RATE BY 0.25% AND THE SKY HASN’T FALLEN!! 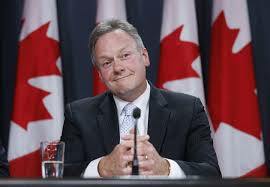 Stephen Poloz, the Bank of Canada Governor, raised the Target rate by 0.25% to 0.75%. Maybe now the media will move on to other news. Seriously, aren’t we all kinda tired of hearing how rates are going to skyrocket,…how this is going to make our mortgages unaffordable… how we have record debt levels.. how we are going to default our mortgages, lose our homes and go into a recession…it’s doom and gloom? This isn’t happening.